3. I'm An AMAZING Person Today! 17. Row Your Boat Round Sung NOT perfectly but fun! 25. Let's Have a PARADE! Let's Pretend CD is an example of the many years I have had the joy to teach young children meaningful music. Every word is purposeful. A song or story may stimulate the imagination and creativity, dramatic play, and instill values of sel esteem, caring, empathy, manners, inclusion, respect, antibullying, multicultural music and most of all love. I want children to never feel alone so I speak with them intimately and warmly. 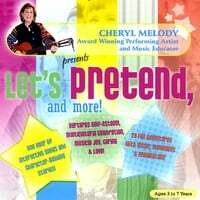 I am a Grammy nominee, received awards for all CDs, have CDs for adults as well as kids, am an author, playwright, website is www.cherylmelody.com, national performing artist, composer, voiceover artist, peace through music philosophy, sound healer, educator. Ty for supporting independent artists. It is so appreciated.